PGA West is one of the top golf destinations on the west coast. The most understated jewel in the deserts of Palm Springs is the PGA WEST Greg Norman Course. Of the available La Quinta golf deals, this one is tops. This well designed course has been cut right out of the desert and should be considered a must play course. The course architect is PGA major championship winner Greg Norman. The PGA WEST Greg Norman Course was opened in 1999. This 18 hole, par 72 course measures 7,156 yards from the black tees. The rating is a difficult 75.1 with a slope of 139. The course is considered a "target" course and accuracy is a must. The narrow fairways are a combination of desert foliage and plush grass landing areas. There are 9 lakes that provide obstacles to clear approach shots. The traps guarding the greens are huge and the putting surfaces are fast. 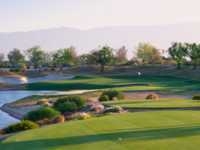 If you are considering La Quinta tee times, you must consider PGA WEST Greg Norman Course tee times. Reservations can be made online and seasonal discounts are available. Amenities include valet service, a practice facility, dining room, carts with GPS, a pro shop and club rentals. Players like the uniqueness of each hole. The holes are named after Australian terms and often define the hole's difficulty. Terrific Course.